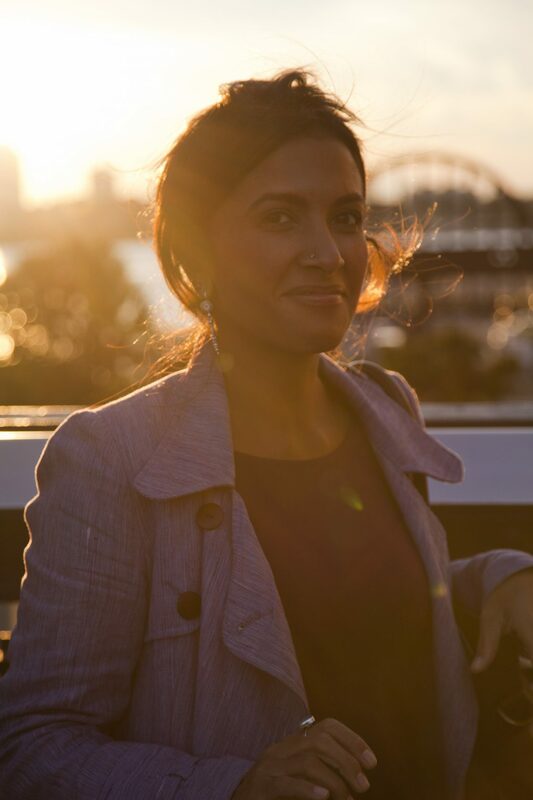 Shalini Kantayya is a filmmaker and owner of 7th Empire Media, a production company that advocates for human rights and a sustainable planet. Her list of awards and accolades are unending – from global film festivals to finishing in the top 10 out of 12,000 filmmakers on Fox’s ON THE LOT, a show by Steven Spielberg in search of Hollywood’s next great director. She’s a TED and Sundance Fellow with an unrelenting spirit. Her latest film, Catching the Sun, is a love letter to the workers and entrepreneurs building solar solutions to income inequality and climate change. It will premier at the Los Angeles Film Festival and she’s launched a Kickstarter to support the film’s final touches as well as public education and impact campaigns. Catching the Sun is positioning itself to become one of the most important clean-tech documentaries of our time. Shalini is an activist whose global ambitions illuminate the neglected shadows of our communities. She’s the ultimate sun catcher. My words fail to describe the presence, creative fervor and fearlessness that is Shalini Kantayya. As a result, I’ll let her share herself in her own words. What inspired you to create Catching the Sun? The journey to make Catching the Sun began because I was looking for hope. In post-industrial cities like Richmond, California, the dream of upward mobility is eroding. The oil economy has created monopolies and concentrated wealth and power in the hands of the few. I was fascinated by the idea that solar power could democratize and decentralize energy in a way that rebuilds the ladder of economic opportunity. Through an unlikely set of characters, Catching the Sun is about people daring to lead a massive global energy transition that is already rapidly in play. You often recount that you “came of age between Brooklyn and Mumbai.” How did your multicultural upbringing influence your global journey in creating Catching the Sun? As a first generation American born to parents who emigrated from India, the idea of “pulling yourself up from your bootstraps” was laced in my mother’s coconut chutney. I was raised to believe that if I worked hard and played by the rules, I could climb the ladder of economic opportunity in the U.S. and achieve my highest dream. As a filmmaker, my work explores how environmental crisis deepens disparities between rich and poor, between the developed and the developing world. I set out to do a small film about American workers, and ended up telling a global story unfolding in real time. The story took me through innumerable twists and turns as I tried to understand the larger global economics that impact whether American workers get jobs in the clean-tech industries of the future. Catching the Sun is a global documentary and reflects my point of view as a global citizen. What are some things people can do to contribute to responsible energy consumption and clean energy industries? Over 36 states in the U.S. have set renewable energy targets mandating a certain amount of their energy come from clean sources. California already runs on 20% renewables, and is setting a goal to move to 33% by 2020. We need to push leaders at the city and the state level for these types of policies. With Congress missing in action, statewide reductions will reduce carbon emissions by 17% by 2030. We all need to push policies that accelerate change. What inspired you to pursue a career in film? Nineteen and wide-eyed, I remember the low deep throated-chant of 800 Tibetan monks praying. I was in the South Indian village of Bylakuppe, one of the thirteen villages that India had gifted the Tibetan refugees. Before I knew aperture or iris, I knew there were experiences that I could not express in words. That was the moment I fell in love with images, and began to put imaginary picture frames on everything I saw. I discovered vision in a new way. My love for the image was just that — impulsive, passionate, all-encompassing, and without reason. But my love for visual storytelling also became integrated with my love for human rights. I have always been inspired by stories of ordinary people who overcome seemingly insurmountable hardships. As the media become increasingly corporate-controlled, I believe that telling these stories is absolutely critical. Frustrated with consolidation of power in six media conglomerates, I founded 7th Empire Media, with the mission of bringing a voice to the unheard. Over the last ten years, my adventure as an independent filmmaker, educator, and activist has given me the opportunity to travel the world in pursuit of a story. On my sojourn, I have had the privilege of meeting many young people blazing trails and creating new ways to live in the world. Reruns of Battlestar Galactica. I want to direct a sci-fi next.